Hundreds of bridges in the tri-state area are “structurally deficient” and need repair, an I-Team review of inspection records has found. Those records show that structural conditions at numerous bridges in New York, New Jersey and Connecticut are deteriorating fast. Engineering experts say none of the spans is on the verge of collapse, but warn some bridges need work to help avoid the kind of disaster that struck in Minneapolis seven years ago when the collapse of the Interstate 35 West bridge killed 13 people. The I-Team combed through the National Bridge Inventory, a database of inspections maintained by the Federal Highway Administration, and found 600 structurally deficient bridges in New Jersey. 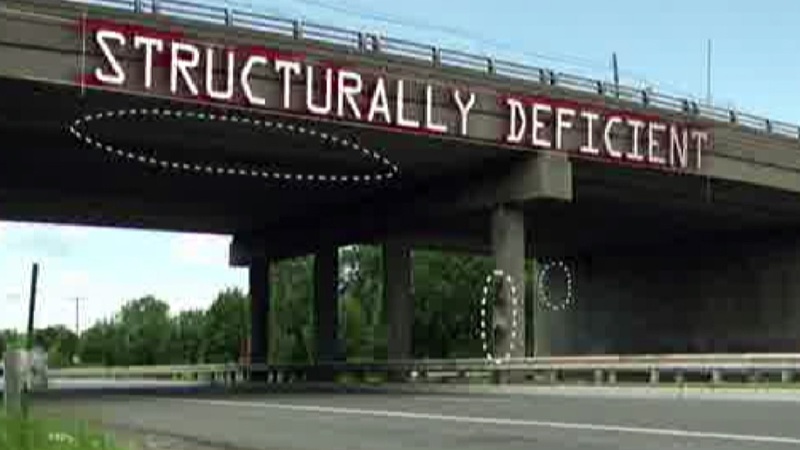 In Connecticut, there are 407 structurally deficient spans. In New York, more than 2,000 bridges have been deemed structurally deficient. Nationwide, it is estimated that just one in nine bridges of 600,000 bridges are structurally deficient. Experts say more than $70 billion in additional spending would be needed to address the needed repairs on bridges alone. The New Jersey Route 35 bridge connector in Perth Amboy is one such span considered structurally deficient. Built in 1960, the span is shorter than a football field but nearly 22,000 cars and trucks cross it each day. From the driver’s seat, it could be hard to understand why inspectors would have a problem with the bridge. A look underneath tells a different story. Concrete is crumbling on the support beams and metal rebar is exposed. Cracks in the piers on both sides of the span reach from top to bottom. The deck and superstructure of this bridge are rated in “serious condition,” according to the national database. That rating is a three out of nine on the scale inspectors use to describe the condition of a bridge’s structural elements. Costs to repair the Perth Amboy bridge are estimated at no less than $12 million. A spokesperson from the New York City Department of Transportation said that just because a bridge is rated “structurally deficient” that does not mean a bridge is unsafe or about to collapse. Low ratings do show that repairs are needed and the bridge needs regular monitoring, however. Bridges are supposed to be inspected at least every two years, authorities say. But those with low ratings get inspected more often. The Broadway Bridge connecting Inwood in Manhattan and Marble Hill in the Bronx is one such span. Inspectors rated the roadway and the beams holding it up as “poor.” Every day 31,400 vehicles use this bridge to cross between the boroughs. A spokesperson for the city DOT said design plans are being drawn for a Broadway Bridge rehabilitation project scheduled to begin in 2017. Experts said many of the city's major bridges have seen some improvement in recent years due to years of significant investment. Last month, with funding for the Highway Trust Fund running low, Congress voted to authorize a short-term fix of about $11 billion for all transportation projects.